In the IELTS Test, there are so many important skills to demonstrate to the examiner, and not always enough time for many candidates. 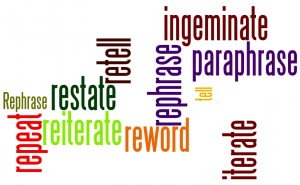 Learning the skill of paraphrasing will help every single IELTS Test candidate. Paraphrasing isn’t magic in the sense of a magician’s spell but mastering the use of a paraphrase will definitely help candidates, as if they had performed a trick. There are two productive skills candidates need to demonstrate to the IELTS examiner on the day of the exam: Speaking and Writing (both tasks 1 and 2). In these tasks, paraphrasing is required if higher IELTS band scores are to be earned. In each of the three question types of the Speaking test, the candidate is expected to paraphrase. In the first task, a straightforward way of answering the questions is to paraphrase them. For instance, with the question “Do you like birds?” candidates could start off by saying: “Oh, birds are simply adorable.” With this example, notice that both the sentence structure and the vocabulary are modified without changing the meaning. This is how paraphrasing helps candidates; especially those who are concerned about their ability to answer questions without lengthy pauses or silences. The technique helps candidates respond spontaneously. In task 2, the lead question usually asks candidates to describe or talk about a particular person, object, or event (e.g. Describe a special celebration you hosted 10 years ago). Given this question, candidates could use paraphrasing to simply replace some words with their respective synonyms. A response to this question could start with: “Let me tell you about a remarkable birthday party I arranged a decade ago“. Just like in task 1, candidates just need to use synonyms or related expressions to enhance how they are assessed by the examiner. 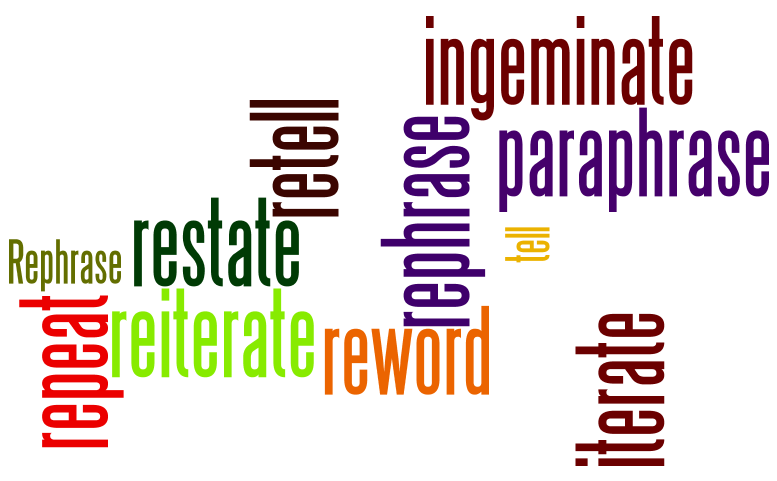 Paraphrasing is most helpful in answering task 3 of the Speaking exam. This is because the questions require abstract reasoning, imaginative discussion, and a detailed explanation. So, use of paraphrasing in a candidate’s introduction would create a good impression in the mind of the examiner. Almost without exception, the first responsive step for candidates in IELTS Writing task 1 is to paraphrase the heading or question. This is one of the items on the IELTS Test examiners’ checklist. For example, if the question heading include’s: “The table shows UK’s annual spending on [five important goods] between 2000 and 2010”, candidates could paraphrase by saying: “The table shown presents details of UK’s yearly expenditure on [the five goods enumerated] in the decade to 2010”. Finally, in IELTS Writing task 2, candidates need to paraphrase the question as part of development of a good introductory paragraph. Successful sports professionals can earn a great deal more money than people in other more important professions. Some people think this is fully justified whilst other think it is unfair. Discuss both views and give your opinion. In the example, the first two sentences in the sample introduction express the same idea as that of the first two sentences in the question. Paraphrasing has been used to achieve this. The last line in the introduction is the thesis statement, which directly addresses what the question asks about. If you would like further coaching on paraphrasing and how to apply it to improve your IELTS band score, we offer an IELTS Writing assessment and coaching service which helps candidates prepare for the two IELTS Writing tasks.